We all struggle to get up in the mornings but a new futuristic alarm clock can change the way you start your day. You won’t be sleeping through this alarm because a clever trick makes sure you are out of bed. We have all been guilty of hitting snooze on the alarm and falling straight back into a deep sleep, but it only leads to a mad, frenzied morning dash. Not a great start to the day. Ruggie makes sure you are up-and-at-em because this is an alarm clock that you must stand on to turn it off. Made of soft fleece wrapped around a memory foam pad, Ruggie is a welcome sensation first thing in the morning. To switch off the alarm you must place both feet on Ruggie for a full three seconds and then this fab furry rug will deliver a positive message to motivate you for the day ahead. We don’t need to tell you how helpful it will be for parents… but we will! Imagine, no more thrown-together-at-the-last-minute lunch boxes or scruffy pony tails for the school run. Take a look at the video below for a more detailed look at what Ruggie can do. If motivational messages are not your thing, you can customise Ruggie via a USB plug in to your computer. Why not change that spoken message into your favourite song or a round of applause? 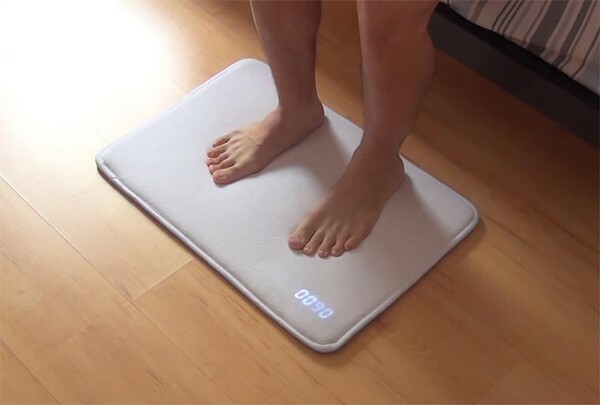 Ruggie also works as a night light – simply place your foot on the rug and a soft light comes on displaying the time. They really have thought of everything. When it hits the market, the estimated price of Ruggie is US$99, but if you back this project via their Kickstarter page you can get your own for much less. A pledge of US$79 will get you one Ruggie with USB cable and an ebook on successful morning routines.